Chuck E. Cheese’s Restaurant: drive on tables, jump from pizza boxes and dodge birthday cakes and ice cream. Space Base near Planet Purple: drift on asteroids and through space tunnels, boost across futuristic landscapes with solar panels, floating debris and holograms. Sunlit Canyon: overtake your opponents on dusty country roads, steer past cacti and barnyards, be careful not to fall off the old wooden bridges. Plus, win tickets you can redeem on your next visit to your local Chuck E. Cheese’s! Accelerate, brake and jump to navigate race tracks full of surprises! Try and complete a set of exciting missions, including time trials and elimination races! Speed past the competition in Chuck E.’s signature convertible or Jasper’s mighty pick-up, and Helen’s speedy sport car! 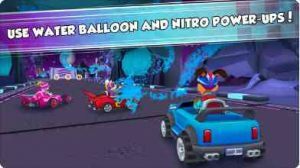 Use NITRO to gain extreme speed and leave your rivals behind! Throw WATER BALLOONS to make other racers spin and stall! Compatible with iPhone 5s, iPhone 6, iPhone 6 Plus, iPhone 6s, iPhone 6s Plus, iPhone SE, iPhone 7, iPhone 7 Plus, iPhone 8, iPhone 8 Plus, iPhone X, iPhone XS, iPhone XS Max, iPhone XR, iPad Air, iPad Air Wi-Fi + Cellular, iPad mini 2, iPad mini 2 Wi-Fi + Cellular, iPad Air 2, iPad Air 2 Wi-Fi + Cellular, iPad mini 3, iPad mini 3 Wi-Fi + Cellular, iPad mini 4, iPad mini 4 Wi-Fi + Cellular, 12.9-inch iPad Pro, 12.9-inch iPad Pro Wi-Fi + Cellular, 9.7-inch iPad Pro, 9.7-inch iPad Pro Wi-Fi + Cellular, iPad (5th generation), iPad Wi-Fi + Cellular (5th generation), 12.9-inch iPad Pro (2nd generation), 12.9-inch iPad Pro Wi‑Fi + Cellular (2nd generation), 10.5-inch iPad Pro, 10.5-inch iPad Pro Wi‑Fi + Cellular, iPad (6th generation), iPad Wi-Fi + Cellular (6th generation), iPad Pro (11-inch), iPad Pro (11-inch), iPad Pro (12.9-inch) (3rd generation), iPad Pro (12.9-inch) (3rd generation), and iPod touch.